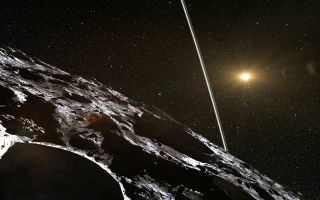 An illustration shows the rings from the surface of the ice-rock centaur Chiron. Astronomers have spotted possible rings around the minor planet Chiron, suggesting that ring systems may be more common throughout the solar system than scientists had previously thought. A team of scientists at the Massachusetts Institute of Technology (MIT) saw signs of rings while watching Chiron — a 145-mile-wide (233 kilometers) object that orbits between Saturn and Uranus — pass in front of a bright star, in a process known as an occultation. After its discovery in 1977, Chiron was classified as the first "centaur" — a body between Jupiter and Pluto with characteristics common to both asteroids and comets. Today, there are more than 200 known centaurs, and scientists estimate that there are more than 44,000 of these hybrid asteroid-comets in the solar system. In the late 1980s, astronomers observed that Chiron exhibited patterns of brightening, as well as activity similar to that of a streaking comet. In 1994, observations made during a stellar occultation suggested the presence of jets of water ice on Chiron. Ruprecht and her team determined that Chironwould pass in front of another relatively bright star on Nov. 29, 2011. They observed the event, which lasted only a few minutes, using NASA's Infrared Telescope Facility and the Las Cumbres Observatory Global Telescope Network, both in Hawaii. The observations produced an unexpected result. A single body would block out the starlight all at once. But the telescopes showed that the light from the star was blocked before and after Chiron moved in front of it, suggesting that dust or rocks surrounded the centaur. An artist’s rendition shows how a pair of rings may surround the centaur Chiron, possibly explaining how its brightness changes over time. The astronomers saw features on each side of Chiron with a width of 1.8 and 4.3 miles (3 and 7 kilometers), separated by a distance of 6.2 to 8.7 miles (10 to 14 km). This could indicate two rings similar to the two rings discovered last year around Chariklo, the only known centaur larger than Chiron. "Rings may be more common than we thought," Ruprecht said. "We're hoping to observe other similar bodies to look for such features." But she and other team members remain cautious, as rings aren't the only possible explanation for what they observed. For example, the intriguing features may have been caused by a shell of dust or gas around the centaur, or by the previously suggested presence of jets of dust or water, the researchers said. The new study was published in the journal Icarus. Ruprecht's team isn't the only group curious about ringed centaurs. "The measurements had very remarkable similarities to some of the measurements that were made in the stellar occultation by Chariklo," José Ortiz, of the Institute of Astrophysics in Spain, said of the new Chiron observations. Ortiz was part of the team that found Chariklo's rings. "Those measurements, together with much weaker constraints from previous occultations by Chiron, could give a rough idea on the possible orientation of a ring system in Chiron," Ortiz told Space.com via email. Observations of Chiron have shown that its brightness changes over time, and that water-ice features observed on the centaur shift or even disappear. According to Ortiz, the presence of rings with changing orientations as seen from Earth could explain such variations, particularly if the rings were the source of the ice. In their research, which was published earlier this year in the journal Astronomy & Astrophysics, Ortiz and his team wrote, "A ring system is the only way we can think to cause a large magnitude [brightness] change." The rings of Saturn show prominent spectroscopic water-ice features, Ortiz said. Further research revealed that the water ice on Chariklo is also in the rings. "Chiron and all the centaurs are the progenitors of the Jupiter Family Comets, so we expect that the surface composition of centaurs and comets can be similar," Ortiz said. "And comet nucleido not show detectable water-ice features in the spectra of their surfaces, so it seems the water ice detected in Chiron is very likely in the rings, not on the surface." Ortiz and his co-authors dismissed the idea that a shell of dust or gas could explain the Chiron data. They said a shell would likely block starlight, not create two symmetrical features. An elliptical shell could theoretically create the sharp spikes in starlight, Ortiz said, but the shell would have to be spherical to explain the observations taken from two different sites. Furthermore, no ellipsoidal shells have ever been observed around a comet. While Ruprecht and her team suggested that jets could also explain the unusual signals, Ortiz questions why jets would give either symmetrical configurations or the double structure. He also pointed out that the centaur was in a quiet state at the time of observations, providing no source for a jet. Ruprecht said she's more cautious; she stressed that Chiron needs to be studied further in order to make a definitive assertion about the unusual features. "While the recent discovery of rings around Chariklo make it more plausible, we've shown several possible interpretations — jets, plumes, etc. — that are all consistent with our data," Ruprecht said. "Only with further observations will we be able to determine the actual situation." If rings do exist around Chiron, they could have broad implications for other centaurs and trans-Neptunian objects. Several occultations have already been observed for TNOs, and no signs of rings have been spotted. It's possible that rings form only in the Jupiter to Neptune region, where the centaurs lie, rather than beyond Neptune, Ortiz said. One reason is that rings might form by collisions, which are more common in the centaurs' neck of the woods. No rings have been observed in the asteroid belt, either, despite numerous occultations. If collisions form ring systems, impact speeds in the asteroid belt may be too slow to create them, Ortiz said. He cautions that these lines of thought are speculative, and more research will be required to support them. Still, rings formed by collision could provide insight into the history of the centaurs. Such collisions could be more common than once thought. Or perhaps the rings of Chariklo and Chiron were formed long ago, before they were captured from the trans-Neptunian region. "In that case, the rings would have survived very long, which would be remarkable," he said. If the rings instead formed by other methods, it would have different implications. "If the rings are caused by satellites, this may mean that centaurs could have many satellites," he said. "There are many different possibilities that we are now trying to explore." Ortiz and his team also speculated on the relationship of centaur color to the possible existence of rings. If rings contain the water ice within the system, centaurs with rings would be bluer, as both Chiron and Chariklo are. Many centaurs are similar in color to Chiron and Chariklo, so ring systems may be very common among centaurs. Since similar color differences also exist in small TNOs, some of these objects may also boast rings. Understanding the extent to which rings dominate in small bodies of the outer solar system will require further study — a challenging process. Stellar occultations of particular bodies are not very common and can be difficult to predict. "To detect a ring reliably, several observations from several sites during an occultation are needed," Ortiz said. The shadows of centaurs are the same size as the objects themselves, making it difficult to observe a single occultation at several sites. The occultation of Chiron was observed by two telescopes about 80 miles (129 km) apart. Chariklo's rings were spotted using instruments in what Ortiz called "one of the areas of the world with a dense telescope coverage." As scientists gather more data about Chiron and other small centaurs, more rings or orbiting features may be found. Varied features around a range of objects can help scientists understand how these objects form in the solar system. "It's possible that the study of different ring systems at such varied size scales — from giant planets to tiny planetoids — will teach us a lot about how such structures form," Ruprecht said.